While the ocean environment has conditioned every aspect of the Newfoundland and Labrador experience, the province also has ample fresh water, the source of which is abundant precipitation. More than 8% of the area of the province is occupied by lakes, slightly greater than the average for Canada, and as elsewhere water is also stored in the soil, either close to the surface where it can be used by plants or deeper in the rock as groundwater where it may be tapped by wells or returned to the surface in springs. 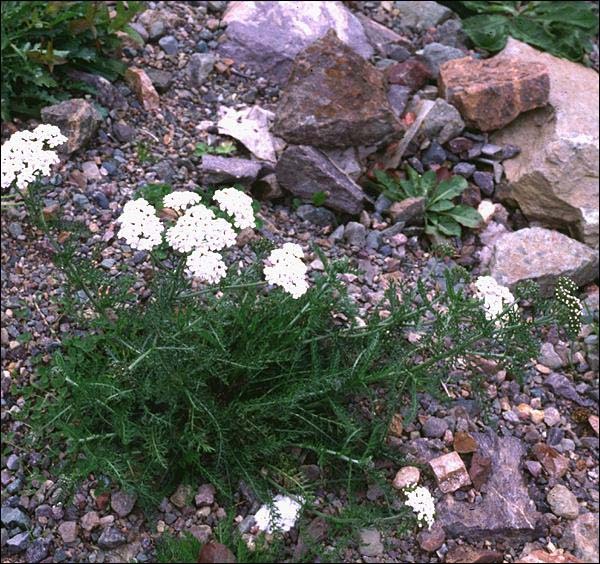 The province's many species of plants depend on water that is stored in the surface of the soil. Reproduced by permission of Trevor Bell. Besides lakes and groundwater, Newfoundland and Labrador also have many rivers. These rivers show marked seasonal variations of flow. Throughout the province peak flow occurs in late spring or early summer as the result of spring run-off, when winter snow melts and runs over the surface directly to the nearest stream. In the southern part of the island peak flow occurs as early as April, but in central Labrador it occurs as late as June. Some of the melting snow infiltrates into the soil (if the soil is not frozen), moving slowly downslope. Some of this soil water percolates deeper to the groundwater, moving even more slowly. During late spring and early summer months, melting snow and precipitation create peak water flow in rivers and streams. Reproduced by permission of Wendy Churchill. Photo ©1990. During the later part of the summer and the fall streamflow is related to the balance between precipitation and evapotranspiration. Evapotranspiration is at a maximum in summer, when temperatures are higher and plants are growing strongly. Farmers and gardeners know that the soil is much drier in summer than in spring or fall; this is the result of high evapotranspiration during the growing season and means that very little of the rain that falls in summer reaches a stream. Although stream flow is low during the later part of the summer, streams rarely dry up completely. Lakes in a streams's course store some of the spring run-off and help to maintain flow as do springs fed by groundwater. Man-made reservoirs on dammed streams function like natural lakes to reduce peak run-off and maintain flow during the summer. With the approach of fall evapotranspiration decreases, and in the southern part of the island precipitation increases. Soon the soil holds as much water as it can (it is saturated), and the surplus reaches the streams whose flow increases. Illustration by Duleepa Wijayawardhana, 1998. In winter, when temperatures fall below freezing and precipitation falls as snow, no surface water reaches the streams and flow decreases again. In Labrador and the northern parts of the island where winters are long and severe, this is the season of minimum streamflow. In central and southern parts of the island, where precipitation can fall as rain during the winter, the winter streamflow minimum is less marked than the summer minimum. 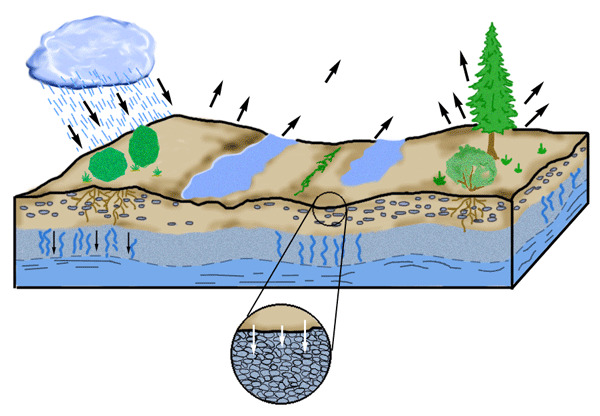 The volume of water discharged by a stream is also affected by the size of the drainage basin. The Waterford River, that runs through St. John's, the capital of Newfoundland and Labrador, drains a small basin and the mean rate of flow in April is less than 5 cubic metres per second. In May, the month of maximum discharge in the Gander River (in central Newfoundland), the mean discharge is more than 250 cubic metres per second. 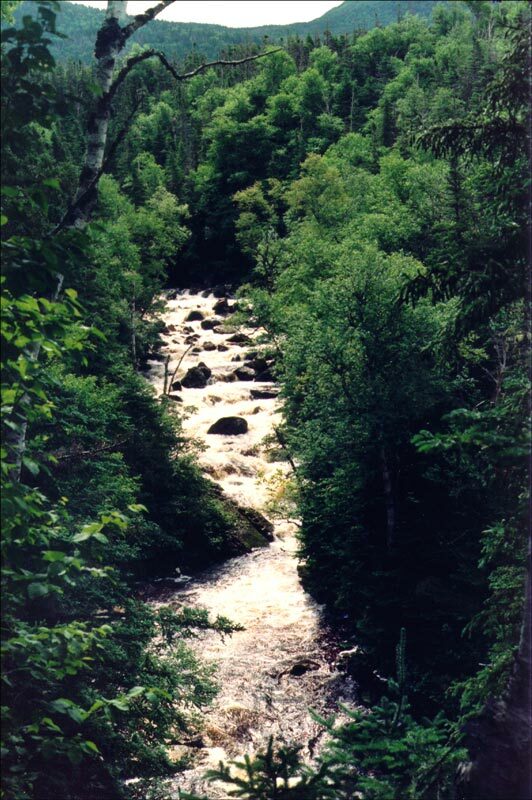 The provincial record is held by the Churchill River in central Labrador which discharges an average of almost 2000 cubic metres per second in June.